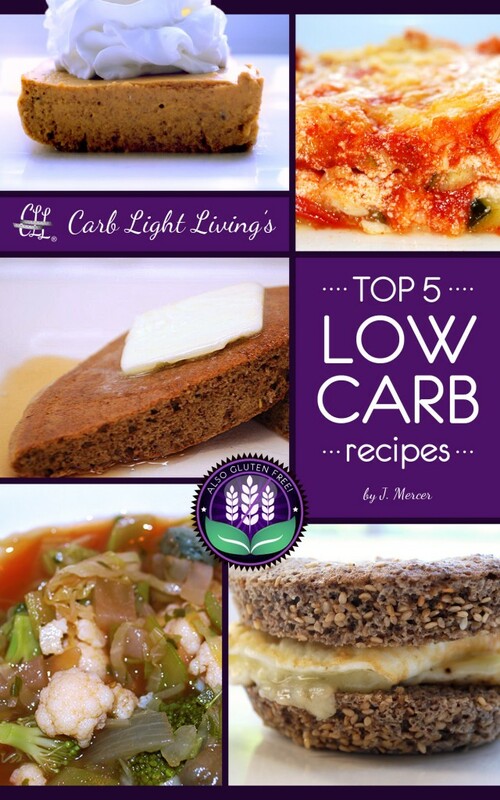 The Top 5 w Carb Recipes (also gluten-free) presented by Carb Light Living™ is a flavorful collection of five satisfying and slimming low-carb makeovers of some of American’s favorite foods, using imaginative ingredient substitutions. Enjoy pancakes again – every day if you like – and bring back lasagna for Sunday dinner! This gluten-free, low-carb collection of Joann and Gary Mercer’s personal favorites can be used in your current weight loss program or by following the Carb Light Living™ program guidelines, which allow people to continue to eat the foods they love, while on 1 of the 3 available fat-burning tracks. Enjoy these family favorites, which are staples in the Mercer household, and which have helped husband Gary lose 40 pounds in one year! Carb Light Living™ Ancient Grain Pancakes: go Aztec with this Amaranth- and Chia-packed powerhouse of a pancake with less than 12 carbs and 159 calories per pancake. Seltzer water provides a fizz which gives it its fluff. Carb Light Living™ Fun Bun: an 11-carb high fiber and hearty breakfast bun of 249 calories that you “bake” up fresh in the microwave in just 90 seconds. Carb Light Living™ Vegetable Soup: the easiest soup you’ll ever make. Simply place all ingredients in the pot and simmer – enjoy this flavorful and filling soup anytime at 17 carbs and 77 calories per serving. Carb Light Living™ Zucchini Lasagna: simply replace the lasagna with evenly-sliced zucchini “noodles” and you have a large serving for fewer than 11 carbs and 289 calories. Even traditional lasagna lovers and those with lachanophobia (fear of vegetables) will love this satisfying and flavorful version. Carb Light Living™ Pumpkin Pie Squares: these luscious pumpkin pie squares are so easy to make with just 6 ingredients. They won’t expand your waistline, and at just over 5 carbs and 77 calories per piece you can enjoy them as a dessert or snack! Hi – what is not actually loading? what post?